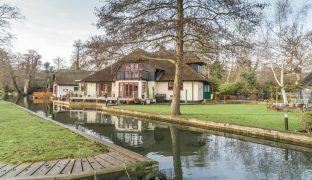 Built by the owners in 2004 this beautifully presented waterside residence is set just off the River Bure and offers well proportioned and flexible accommodation, a private mooring and a detached wet boathouse with generous ancillary accommodation. 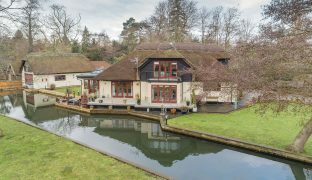 Built by the owners in 2004, this beautifully presented waterside residence is set just off the River Bure and offers well proportioned and flexible accommodation, a private mooring and a detached wet boathouse with generous ancillary accommodation suitable for a variety of uses. 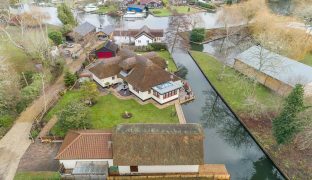 Of timber construction under a thatched roof set on steel piles, this extended and improved riverside home has been designed to combine the best modern materials and standards of finish with the style and character of a traditional Broads residence, complemented by the idyllic location. 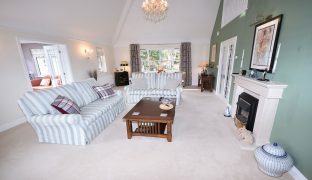 The accommodation comprises a spacious reception hall which also doubles as a dining room. 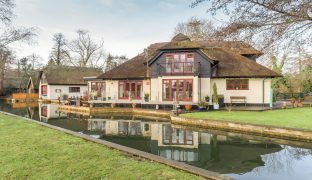 Double doors lead to an impressive dual aspect living room with high vaulted ceilings and a view of the water; this in turn leads to the sun room, bathed in natural light looking over the mooring. 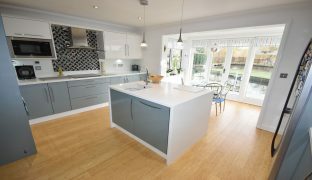 The recently refitted and extended kitchen/breakfast room now has a contemporary finish combining high gloss units with Corian worktops and an abundance of built in appliances. 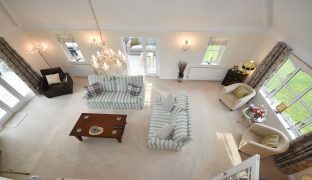 The ground floor continues with a utility room, shower room, two double bedrooms and one en-suite bathroom. 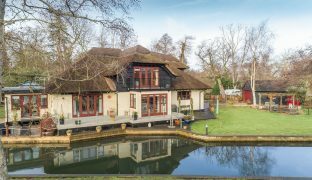 The first floor is arranged as one spacious master suite with a generous master bedroom leading out onto a balcony offering river views, a large five piece en-suite bathroom, two walk in wardrobe/dressing rooms and a galleried study area looking over the living room. 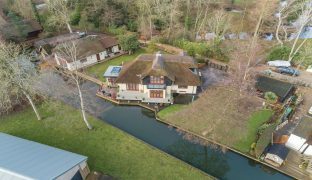 The boathouse was built in 2007 and provides a secure undercover mooring for one boat and further ancillary accommodation, currently arranged as a 22ft long living room with kitchenette, double bedroom with covered balcony and en-suite shower room. 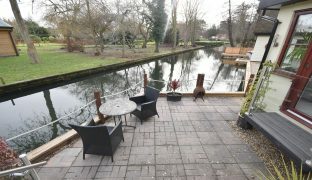 The landscaped gardens are laid mainly to lawn with a selection of decked and paved seating areas and a variety of mature trees, shrubs and flowering borders. 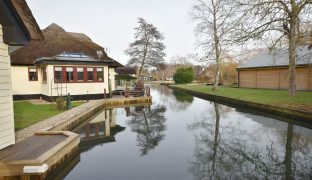 There is ample parking for a number of cars/boats/caravans etc with a detached garage and a 32ft side on mooring. 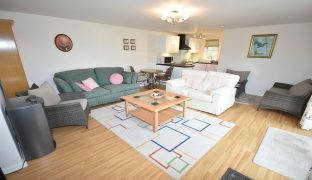 Additional features include sealed unit double glazing, oil fired central heating, electric underfloor heating to the kitchen, master en-suite bathroom and the rear porch and a heat recovery system. 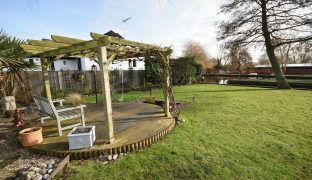 A high quality property in a tranquil location, early viewing recommended. 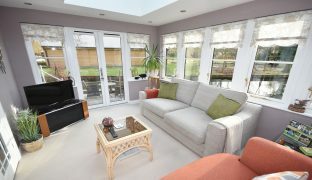 Triple aspect sitting room with large roof lantern, radiator, additional electric heater, spot lights and French doors leading out onto the waterside patio. 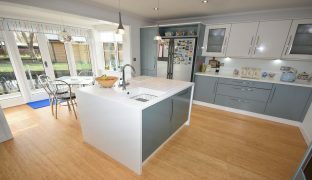 Recently extended and fully refitted with a full range of wall and floor mounted units with a contemporary gloss finish, with Corian worktops and under unit lighting. 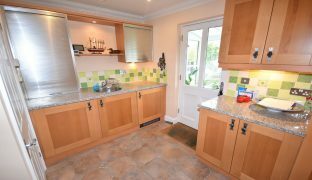 The central island unit contains a sink unit and drainer, built in appliances include an electric oven, hob and extractor fan, microwave, dishwasher and a large fridge/freezer. Down lighters and pendant lighting. 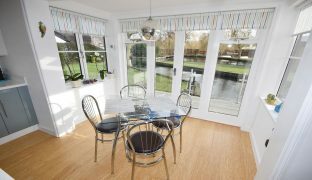 Wooden flooring, moulded cornices, under floor heating, box bay window with French doors leading out onto the waterside decking. 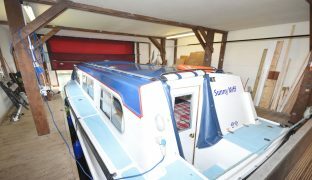 Under floor heating, door to rear. 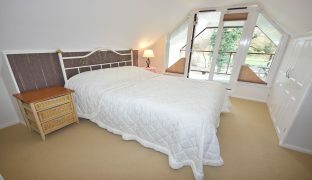 Dual aspect, fitted 3 door wardrobe and dressing table, radiator, moulded cornice. 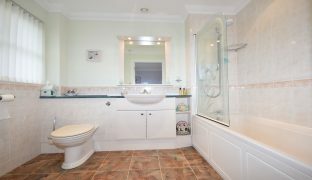 Low level w/c, vanity wash basin, panelled bath with fitted shower and screen. 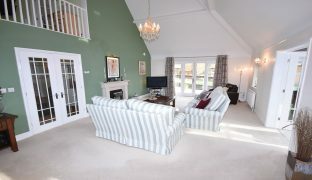 Moulded cornice, extractor fan, radiator, down lighters, partially tiled walls, window to side. 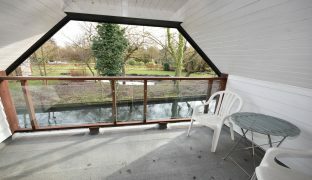 Window to front aspect with views over the water. Radiator, moulded cornice. 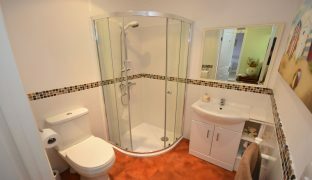 Low level w/c, vanity wash basin, shower enclosure, heated towel rail, partially tiled walls, extractor fan, coved ceiling. 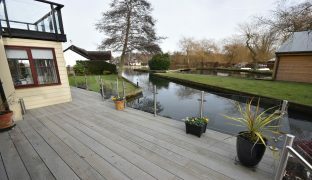 French doors leading out onto a balcony overlooking the water and the river beyond. 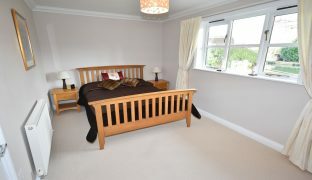 Fitted range of furniture with double wardrobe, bedside cabinets, dressing table and chest of drawers. 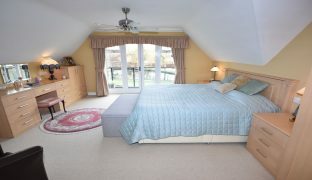 Ceiling fan, walk in wardrobe with radiator. 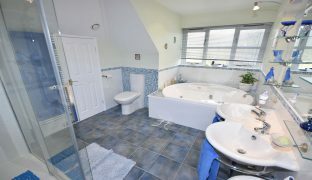 Large circular jacuzzi bath, twin wash basins, double shower enclosure, low level w/c. 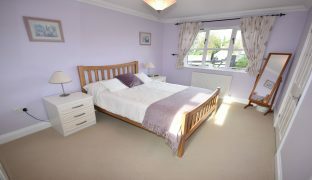 Under floor heating, heated towel rail, down lighters, partially tiled walls, extractor fan, large walk in wardrobe: 13’3″ x 8’10”: fitted hanging space. 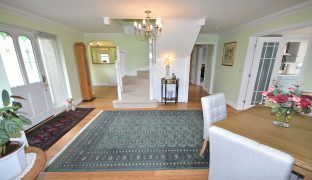 Laminate wooden floor, night storage heater, staircase to first floor. 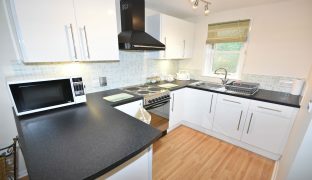 Kitchen area with range of wall and floor mounted units, sink unit and drainer. 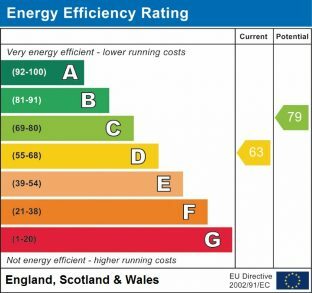 Electric cooker point, extractor hood, window to rear. 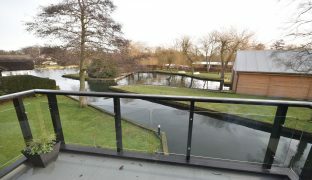 Built in double wardrobe, wall mounted electric heater, French doors out onto a covered balcony looking out over the water. 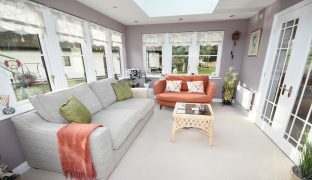 Low level w/c, vanity wash basin, shower enclosure, heated towel rail, tiled floor, extractor fan, partially tiled walls. 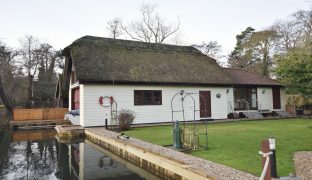 The boathouse also benefits from its own parking area. 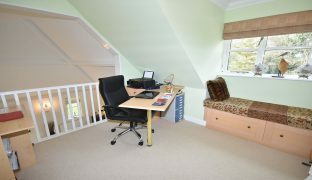 Offering incredible flexibility, this accommodation could be used in a number of ways: home office, gym, hobby room, cinema room, artist’s studio to name but a few. 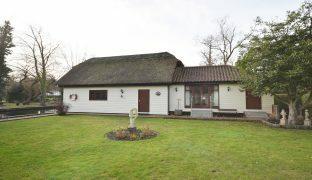 Use as an annexe or as a holiday let would be subject to planning permission. 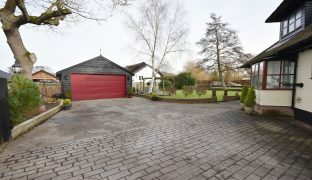 The property is approached via a private roadway with a remote controlled gate giving access to the brick weave driveway, which in turn leads to the detached Timber Garage: 19’2″ x 16’1″ with power, light and a remote controlled roller door. 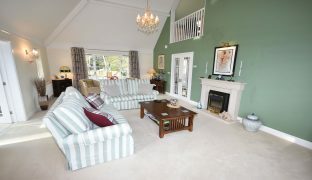 The landscaped garden is mainly laid to lawn with a variety of mature trees, shrubs and flowering borders ,and the house is well served for external lighting, power points and taps. 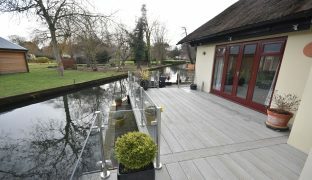 Raised composite decking with glass screening runs along one elevation, looking out over the water and beyond to the River Bure. 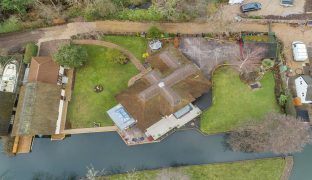 There are additional paved seating areas and a circular deck with pergola with approximately 150ft of private quay headed frontage directly onto a private dyke, set only a matter of a few metres away from the River Bure, with access to the entire Broads network. 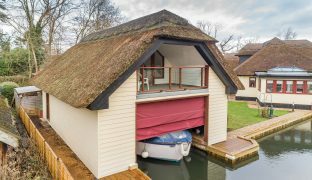 To complement the boathouse there is an additional side on mooring measuring approximately 32ft long with space for a further dinghy or small day boat. Services: Oil fired central heating, bore hole water, septic tank drainage.